Cardiovascular disease is the nation’s leading killer of adults, according to the Centers for Disease Control and Prevention. As a leader in CT imaging, Baptist Hospital South Florida continues to set the pace by becoming the first healthcare facility in Miami-Dade County to have the Brilliance iCT256 CT scanner. This new technology has major benefits for both physicians and patients. “The iCT scanner allows physicians to assess the risk of coronary disease for high-risk patients with a family history of disease, as well as assess acute chest pain in patients in emergency situations,” says Constantino Pena, M.D., director of vascular imaging at Baptist Cardiac & Vascular Institute. “The shutter speed on the iCT scanner is very quick, and the images are so crisp with a wide resolution — it can capture a detailed image of the entire heart in just two beats, while it reduces the radiation exposure by 80 percent,” Dr. Pena says. For physicians the iCT scanner offers the opportunity to diagnose a wide range of life- threatening illnesses, such as heart disease, cancer, stroke and lung disease. “Diagnosed at an early stage, when the disease is more manageable, doctors can recommend more effective treatment options and lifestyle changes that can reduce risk and potentially save lives,” says Dr. Pena. 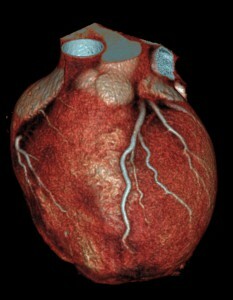 Technology allows doctors to acquire a lifelike picture of your heart with only a small IV. The state-of-the art iCT system also offers patients faster scan times and a pleasant, more comfortable CT scan experience as a result of its open and unobstructed view, which reduces claustrophobic effects associated with the conventional “tube-shaped” machines. Additionally, the new scanner has a larger internal opening, which is easier for larger patients, and DoseWise software technology, which reduces radiation to a minimum amount. The leading-edge scanner is just one of the several new technological advancements currently being implemented throughout the Baptist Health organization, where patients are our number one concern. West Kendall Baptist Hospital is currently in trials with GE Healthcare’s innovative Revolution CT (Revolution CT). The Revolution CT addresses the challenges of getting accurate diagnostic images for patients with high or irregular heartbeats. “This is innovation at its best and is really an all-in-one scanner,” says Ricardo Cury, M.D., chairman of radiology and director of cardiac imaging at Baptist Health South Florida. Dr. Cury is the principal investigator of the study. For more information or to get a referral to a Baptist Cardiac & Vascular Institute physician, call: 786-596-2700, Monday-Friday, 8 a.m.-5:30 p.m. Outside Miami-Dade County, call toll free at 1-800-273-2700, or send an email to referral@baptisthealth.net.